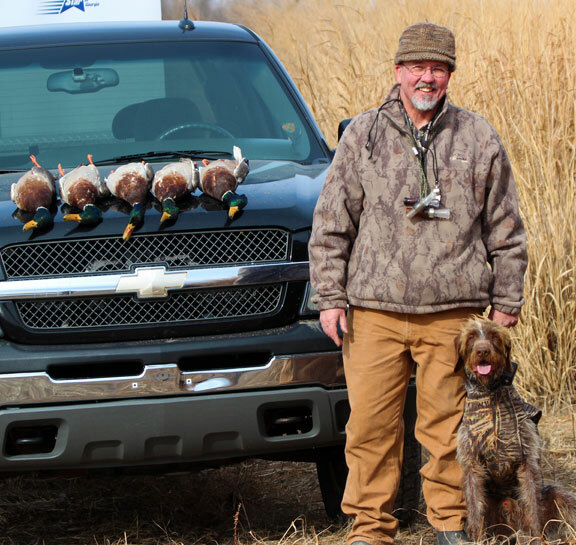 Kansas duck hunting within Mid-America Hunting Association is over pond, lakes, field or dry sets or a combination of wet and dry sets. We do not maintain any managed wetlands or blinds in Kansas. The Association unguided duck hunter would reserve a pond, lake or field for his duck hunt for the days he wanted to hunt. That same hunter would place out his own spread, using a temporary blind. On some of these waters a small boat or dog would be required to retrieve downed ducks from deep water. Field set duck hunters will find crop stubble, mostly corn and soybeans. These fields are prevalent in eastern Kansas where our better duck hunts occur. Mallards on a Kansas pond. Our Kansas hunts are similar to our Kansas goose hunting. That similarity is while we have land from east to west and north to south Kansas it is not all equal when it comes to waterfowl. In terms of duck species Kansas is the same as Missouri for the most common ducks. Our season starts with a fair teal shoot. Prime regular season hunts are for mallard and pintail. Gadwall round out the most commonly hunted ducks. There are plenty of other ducks such as woodys. Same Kansas pond as previous picture. To know where the ducks are at any given time is a tough call. The successful approach is to use the Association private land lease maps and scout out ponds. Having a dozen or so ponds would make for a half day’s drive/scout trip. Once finding a pond or field the ducks are using it would be a matter of a telephone reservation to secure that spot. Set up the spread and blind, call and shoot. Not all that different than hunting our Missouri wetlands. Even in Missouri within the better historic market flyways there is never a guarantee that simply one location over another means a better hunt. That scouting requirement is very much consequence of our self guided duck hunter approach. It is also a benefit as that hunter gains full value from any success or failure he achieves. Mid-America Hunting Association does offer that level of hunts. The unguided duck hunter opportunity that allows hunters to enjoy their day as they see fit to do so. A second penalty of our unguided duck hunter approach is that it does take time to lean the dry and wetlands. 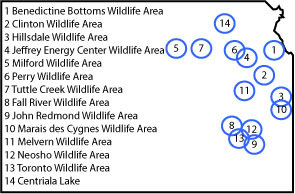 To find the ponds on Association land would first be to use the category listing on the online map library to separate and print the fishing maps, or those with known fish population supporting water. Use those spots as a starting point. The next step would be to identify local streams and nearby rivers. Add to that the larger reservoirs and start connecting the dots. Those Association lands between would be first priority to scout. From those spots scout the surrounding ponds both on and near Association land. Once these are identified, and typically more over a couple of trips, it is easier to more effectively plan a scouting trip. With pond duck and field set duck hunts being more of a scouting effort than a hunt the bulk of a trip is reconnaissance. The actual setup and hunt for many then turns into a skill intensive contest between the ducks natural movement and the hunter’s ability call and decoy in. Much the same approach to spring turkey hunts. It is great when it works, it never works as often as we like and we all have those special memories and satisfaction when it does. Late December during a cold spell. The ice had been transitory up to this point. These simplistic Kansas maps do well at showing where we have found the better Kansas waterfowl hunting opportunities. We are not fancy in our presentation. We try to be informative. 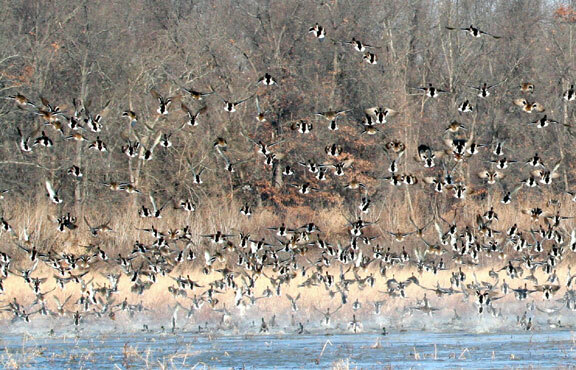 As good as our Kansas unguided hunts may be within our better local area the Association Missouri wetlands duck hunts are better. 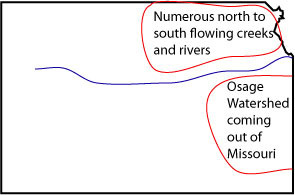 Better in terms of water level controlled enhanced natural wetlands, permanent blinds and geography of being within the Lower Missouri River Basin. When to hunt is always a topic of discussion renewed each season. In general terms for our prime mallard hunts look more towards mid to late December. Kansas duck hunting is available to all Association hunters. It is better in the eastern part of Kansas. Kansas duck hunting in general is not as satisfying as it is Missouri. 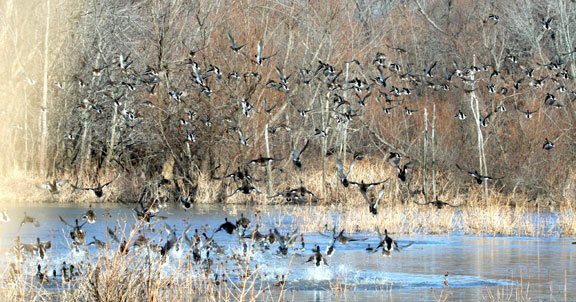 Waterfowl hunters may be better advised to keep Kansas in mind for goose hunts and Missouri duck hunts a better choice. Further proof in this is that this Association may spend money where it wants in our three state region. When it comes to spending money on developing duck attracting wetlands and posting blinds we choose to do so in Missouri. That is where we get a better return for the Association hunter. The last benefit to the Association waterfowl hunter is that he can choose when and how often he may want to hunt. He then has the choice of hunting our managed wetlands, field sets or pond duck hunts. A freedom of choice hard to find in any other organization.